Bones of any animal are generally not recommended for dogs. For whatever reason, we feel the need to bring our domesticated dogs back to the wild in some manner which includes giving them raw or cooked bones. The truth is that a dog’s wild counterpart has an average lifespan of 5 years. Giving your dog whole bones as part of their daily diets can contribute to shortening her lifespan to that of a wolf’s. Whether they are raw or cooked, bones can cause fatal harm in the short or long term. Cooked bones should never be fed to a dog – they splinter easily, potentially choking the dog or causing perforations in her organs. Raw bones aren’t much better – instead of acting as a toothbrush, they damage the teeth and mouth, contrary to popular claims. Whole chicken bones should never be given to a dog. The fragile bird bones can easily be broken in the dog’s mouth forming sharp, harmful splinters. Another danger in giving your dog bones is that they can have a world of harmful microbes. It’s tempting to justify bones as treats because dogs constantly have their noses to the ground. However, an animal bone, cooked or raw, is a breeding ground for bacteria and certainly increases the chances that your dog will be infected. With bones facilitating the growth of harmful bacteria, you and your family are at risk also. Salmonella, E. coli, and staph are just a few of the illness-causing microorganisms. Dogs tend to hide their treats so you may not even notice that a forgotten bone is lurking behind your couch or under the furniture, attracting germs, bugs, and vermin. The bones will contaminate the multiple surfaces they touch such as floors, carpets, and furniture. 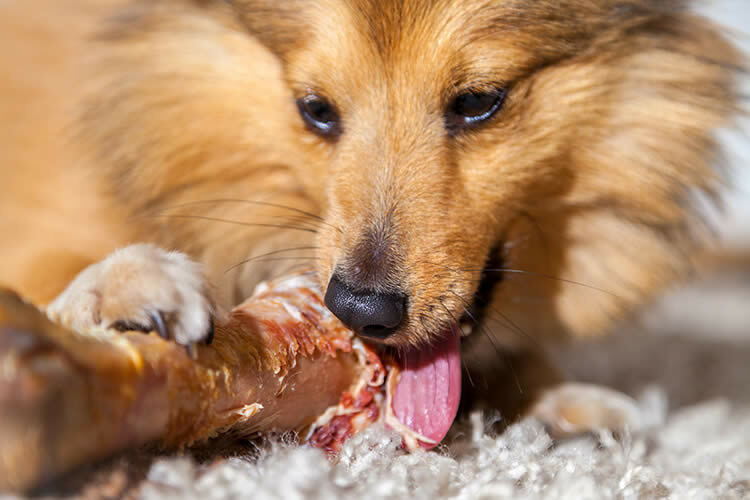 Dogs love bones and they are a great source of nutrition. While giving your dogs unfettered access to whole bones is not the best idea, you can try to incorporate them into the diet. The best way to add bones to a dog diet is through bone meal. Most likely, you wouldn’t have the appliances necessary to grind bones down to a fine mush. Fortunately, bone meal is manufactured. Find a human-grade brand and add a little powder to your dog’s food every day. Some dog food manufacturers use the just the right amount of bone meal in their nutritionally complete products. Freeze dried raw food companies use the highest quality ingredients. Although these brands are usually expensive, they make a big difference in your dog’s quality of life. Another option is to buy beef bones and freeze them for 48 hours. Doing this will kill off bacteria and parasites. After 48 hours, let them thaw in the refrigerator for a day. Use a chopstick or a tool of similar size and scoop out the marrow. Don’t give them too much marrow; along with being nutritious, it is rich and fatty. When in doubt about bones or where manufactured bone meal is sourced, use non-rawhide chews such as pizzle sticks or dental chews. Bones aren’t the best way to clean a dog’s mouth. There are much safer chew sticks that are highly digestible and won’t break your dog’s teeth. For non-food options, the rope toys that have come out in recent years act as a good floss. If you are looking to keep your dog’s teeth clean, don’t rely on a dirty animal bone to do the trick. To keep their mouths healthy, brushing their teeth daily and taking them to a vet for yearly dental work is imperative.